Peter Ornstein received his B.A. in psychology from Harpur College of the State University of New York in 1963, his M.A. in psychology from Queens College of the City University of New York in 1965, and his Ph.D. in experimental psychology from the University of Wisconsin in 1968. Following five years as an assistant professor at Princeton University, he joined the faculty of the University of North Carolina at Chapel Hill in 1973, where he is now the F. Stuart Chapin Distinguished Professor of Psychology and Neuroscience. At UNC, Dr. Ornstein has served as the director of the Developmental Psychology Program and as chair of the Department of Psychology. He has also been active in the Carolina Consortium on Human Development and the interdisciplinary Center for Developmental Science since their founding in 1988 and 1993, respectively. As a graduate student, Dr. Ornstein’s major area was human learning, with minors in human engineering and educational psychology. His early research was in human classical conditioning with his advisor, David Grant, who also encouraged him to explore a wide range of topics in experimental psychology. In this regard, reflecting the infusion of cognitive ideas into experimental psychology, Dr. Ornstein became very interested in the processes by which individuals encoded, stored, and retrieved information, and these topics formed the core of his initial work at Princeton. Moreover, this research with adults led him to examine memory processes with children of different ages. At first, the aim was to use age differences in strategy deployment to shed light on basic memory processes. But over time Dr. Ornstein became intrigued by developmental questions, and he has spent much of his career working to understand children’s memory and cognition and the factors that bring about developmental change. As his study of development deepened, Dr. Ornstein began to identify as a developmental psychologist. The transition took some time, however, as his new developmental colleagues at UNC – especially Harriet Rheingold and Robert Cairns – helped him understand the difference between an experimental psychologist who studies children and a developmental psychologist. As his new identity was taking hold, with collaborators and students, Dr. Ornstein launched a major research program focused on age-related differences in children’s use of deliberate strategies for remembering. A series of studies identified a transition across the elementary school years from relatively passive to more active types of strategies, as well as linkages between strategy and recall performance. Following these studies of the development of children’s deliberate memory skills, Dr. Ornstein examined children’s abilities to remember the details of salient, personally experienced events. An important aim of this research was to understand the implications of children’s changing memory skills for their testimony in legal settings. More recent research has focused on the socialization of memory in the context of language-based interactions in the family and the elementary school classroom. In a series of longitudinal and experimental studies, Dr. Ornstein and his colleagues and students have focused on linkages between “joint talk” in parent-child conversations about previous- and ongoing-events and preschoolers’ developing skills in reporting their experiences. A parallel program of work, relates aspects of “teacher talk” during instruction in the early elementary school years to children’s developing deliberate memory skills. These socialization-of-memory studies have implications for training programs for both parents and teachers, and also serve to bring Dr. Ornstein back to some of the questions that were reflected in his transition from experimental to developmental psychology. In addition to publishing three books and more than 150 articles and chapters, Dr. Ornstein has been active in mentoring both graduate and undergraduate students. He has also been committed to service to the discipline. 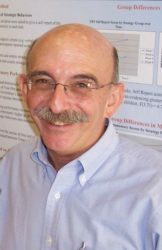 In this regard, he has been involved in editorial work (e.g., serving as Associate Editor of Developmental Psychology) and grant review panels (e.g., serving as a member of the Human Development and Aging study section at NIH), as well as in governance activities and committee work at the Association for Psychological Science, the American Psychological Association, the Cognitive Development Society, and Society for Research in Child Development. Dr. Ornstein currently services as the Managing Trustee of the James McKeen Cattell Fund. * FABBS would like to thank Drs. Lynn Baker-Ward, Deborah Best, Catherine Haden, Nora Newcombe, and Thomas Wallsten for nominating Dr. Ornstein for this honor and for leading the effort. Would you like to honor Dr. Ornstein? It’s not too late to have your name added to the list of donors! You can make your donation to Dr. Ornstein’ In Honor Of… campaign at anytime.